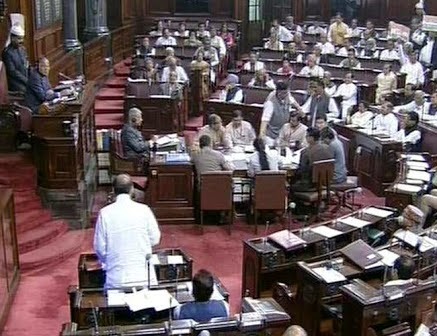 New Delhi : The controversial Land Acquisition Bill was introduced by the government in the Lok Sabha today amid vociferous protests by an NDA ally as also the entire opposition. Almost the entire opposition staged a walk-out calling the bill "anti-farmer and anti-poor". As Rural Development Minister Birender Singh sought Speaker Sumitra Mahajan's permission to introduce the Right to Fair Compensation and Transparency in Land Acquisition, Rehabilitation and Resettlement (Amendment) Bill 2015, virtually the entire opposition was on its feet and members of Congress, SP, TMC, AAP, RJD and Left, among others, trooped into the Well. Raju Shetty, whose party Swabhimani Shetkari Sangathana is an NDA ally, also opposed the measure, saying it would be disastrous for the farming community. Parliamentary Affairs Minister M Venkaiah Naidu tried to placate the opposition members, saying the BJP government was willing to discuss all provisions of the bill but his effort went in vain. Leader of Congress Mallikarjun Kharge said the bill, which seeks to replace an land ordinance, was "anti-farmer and in fact anti-people." "If government had consulted all parties instead of bringing in the ordinance, then it would have been a different matter. But it wants to bulldoze its way," he said as party President Sonia Gandhi was heard telling treasury benches to let him speak. Sougata Roy of TMC opposed the bill with "all the force at my command", while BJD's Bhratruhari Mahtab said his party was opposed to certain major clauses of the measure. Opposition members staged a walk-out as soon as Speaker Sumitra Mahajan allowed Singh to introduce the bill following a voice vote. Naidu accused the opposition parties of "insulting" democracy and said "minority cannot dictate to the majority". He said the erstwhile Congress Chief Minister of Maharashtra had written to the then UPA government in protest against the land acquisition law, which the BJP government now seeks to amend. Naidu also noted that 32 states and Union Territories had made a representation to the Centre, demanding change in the law as it made development "impossible". "Our government gives top priority to the welfare of farmers. We are willing to discuss all points," Naidu said.